Snow Joe SJ620 Review - best electric snow blower ? | These products will change your life. Home » Reviews » Snow Joe SJ620 Review – best electric snow blower ? Snow Joe SJ620 Review – best electric snow blower ? The Snow Joe SJ620 electric snow blower is an amazingly dependable and efficient tool to use to clear walkways, driveways, and even patio quickly. The Snow Joe may not LOOK like a big snow blower, but it definitely acts like one. This snow blower is very easy to use and maintain and is capable of removing 650 pounds of snow per minute. What an amazing feat for any snow blower, but when you also consider that it’s all electric and “green” (good) for the environment, you will be even more pleased with its performance. The Snow Joe SJ620 cuts a path that is 18 inches wide, and 10 inches deep, and in addition, it features a scraper blade that can clear the snow right down to the pavement. It also features a 13.5 amp motor, a 4 blade rotor made of steel, and a 180-degree adjustable chute. 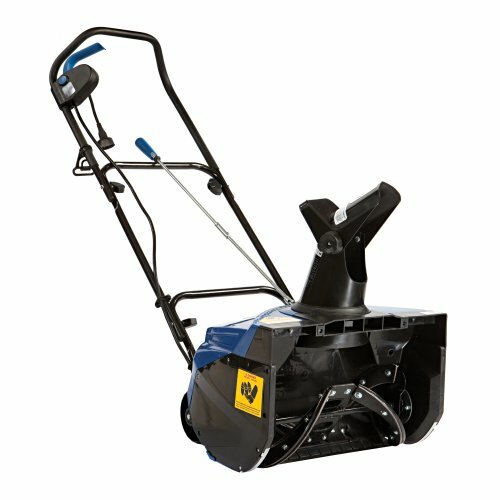 This powerful snow blower can throw the snow up to 20 feet, removing the need to worry about moving the same snow twice. What an amazing, time-saving device the Snow Joe SJ620 is. Potentially, this snow blower could remove an astonishing 2,450 square feet of snow for you every hour. Just think of the benefits of using such a high-performance machine. Not only will you be able to effectively clear your driveway, walkways and other areas, but you can also use it confidently, knowing that it is a green solution, and knowing the great benefits that are being provided to the environment. There will be no need for gas or oil or the fumes that they create, it is a clean, ultra-efficient, and environmentally friendly solution to the problem faced every winter of clearing the snow, no matter how much snow falls. You won’t need tune-ups any longer either, saving you both time and money. The chute that discharges the snow is capable of rotating 180 degrees on the Snow Joe SJ620 and allows you to control the height of the snow “stream” that is being discharged from it. This allows you much better control over where the snow ends up when you are snow blowing. The Snow Joe SJ620 is also very easy to control and maneuver, and features wheels that pivot, making it easier to turn the snow blower around when you reach the end of your path. Maybe one of the best features of the Snow Joe SJ620 is the “push button” start feature. This removes the need to pull start your snow blower, saving you both time and the grief of pulling over and over on a cord just to start it up. This is called “Instant Start” technology and is a very desirable feature. In this snow blower, you will find all of the power of a gas snow blower, in a very compact electric unit. The Snow Joe SJ620 is also ETL approved, and it comes with a full two-year warranty. Reviews of this snow blower have been outstanding, receiving an average of 4.2 stars out of five stars. There have even been reviews from people in states that have very heavy and frequent snowfalls that say that the Snow Joe not only handles the snow but excels at removing it, no matter how tough the winter season is. One reviewer even claimed that his friends had laughed at him for purchasing such a small electric snow blower, but once they saw how well it worked, they were no longer laughing. Now there were one or two reviews saying that the snow blower struggled a bit when the snow was extremely wet and heavy, but that it did do the job and clear the snow for them. So, if you are looking for an extremely effective way to clear snow this winter, and if you would like to make a positive impact on our environmental future as well, look no further than to the Snow Joe SJ620 electric snow blower. By purchasing and using a Snow Joe SJ620, you can have a clean driveway and walkways, and you can feel confident knowing that you’ve purchased a very environmentally friendly, carbon footprint reducing, all electric snow blower that will benefit you for years to come. Snow Joe SJ620 - excellent electric snow blower!